November marks the end of Southwest monsoon and beginning of Northeast monsoon. It is a welcome to the dry season in the Maldives. At the beginning there are some rain that clears off after few hours and affects some regions of the country, not the whole Maldives. By second week of November the weather is more pleasant and sunny. 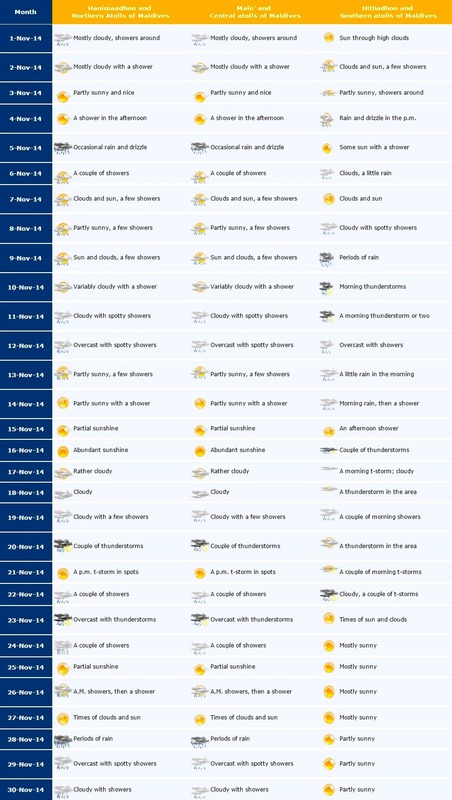 The whole November have instances of cloud, few showers and drizzle that do not last long. That is the reason November is regarded as a month of good weather. Little rain makes atmosphere clear and fresh. Many weather forecasts are based to the capital Male'. The islands of Maldives are formed as a string of pearls, narrow and stretched long from North to South. Our forecast are based to 3 different weather sectors of the country. Maldives is a tropical country. Accuracy of forecasts are very much compromised when you narrow it down to a particular island. Then forecast shows rain for a particular region, you might see it raining to a near-by island and not the island you stay. It happens the other way around as well. Farmers start their fields in November. The land is cleared and crops are planted. Occasional rain is good for these crops. Sunny climate enables farmers to safety move through thick woods of the residential islands. The calm climate comes with a cooling breeze, it is never a struggle for farmers who erect fences around their farms. The steady breeze is great for tourists too. Enjoy sailing, catamaran and wind surfing. When you have a little breeze in the sunshine it is the perfect weather. November is the beginning of this pleasant season.